What kind of Church are you a part of? Getting back into the Senior Leadership of a Church has been thrilling. It is definitely my strength and sweet spot that God designed and called me to do. I love Church world. The good, the bad and the ugly. It makes for an intriguingly interesting life! I love how The Church around the world comes in many forms and persuasions. The only thing required to be The Church is obedience to Jesus. My wife Kelli and I were fortunate years back to be invited into what is called the Mega-Church pastor’s annual conference, where senior leaders of about 60-100 churches all averaging above 1000 in attendance met around round tables to talk Church World stuff. When Kelli and I attended our first one, we both confess to this day, that we had expectations of what all these Pastors would look and sound like. We expected them all to look and sound alike. The reality is that we couldn’t have been further from the truth. These Pastors and spouses were extreme in their differences. We were both very excited and enlightened that God uses all kinds of people to reach all kinds of people. (duh!) 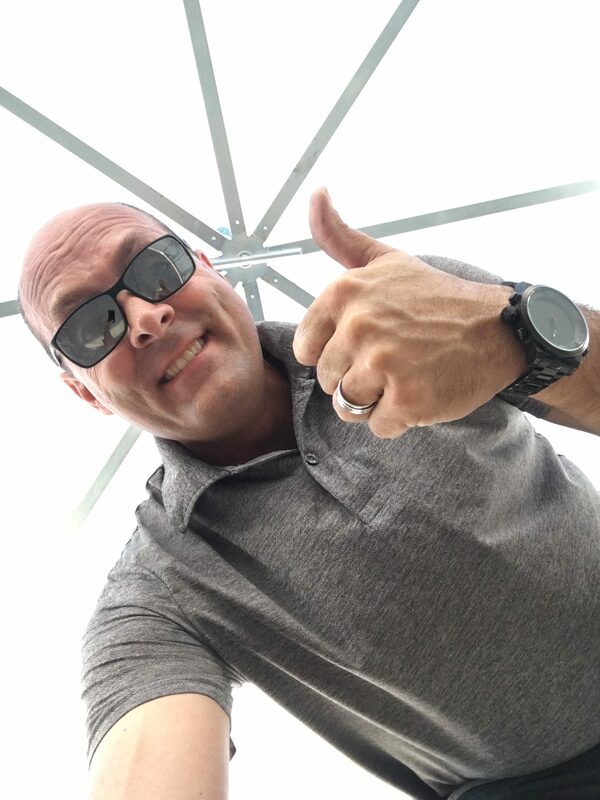 The local Church is awesome…when it is healthy. The local Church is disastrous when it is sick. The three diagrams below are considered very typical and are prevalent Churches in the world. One of the mentalities below is a very healthy Church. (Note I didn’t say, perfect.) There is no such thing. But in the 3 types of Churches…the Staff-Led Church (Pic 3) is by far…BY FAR…the healthiest. 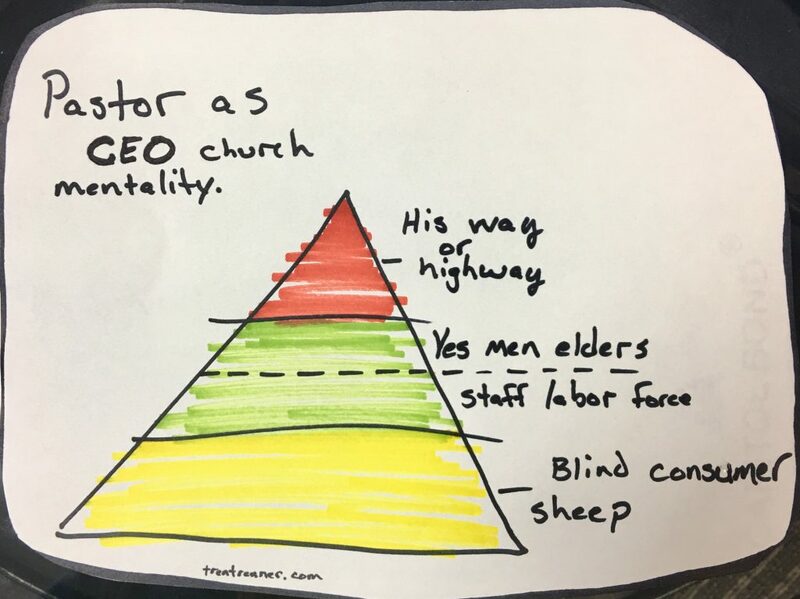 The Pastor as CEO mentality (pic 2) has a lot of health, but also a lot of sickness. The typical Elder-Led mentality(Pic 1) is overtly sick with small elements of health trying to overpower the sickness. My point of all this today… Hierarchies in the Church World do not work in a world that is cursed with sin. Jesus crushes heirarchy mentalities, because He is at the top of all heirarchies and he washes the feet of his enemy and demands the last shall be first and the top shall be bottom. (I suppose the truth is that…Jesus doesn’t crush hierarchies…He just leaves them.) 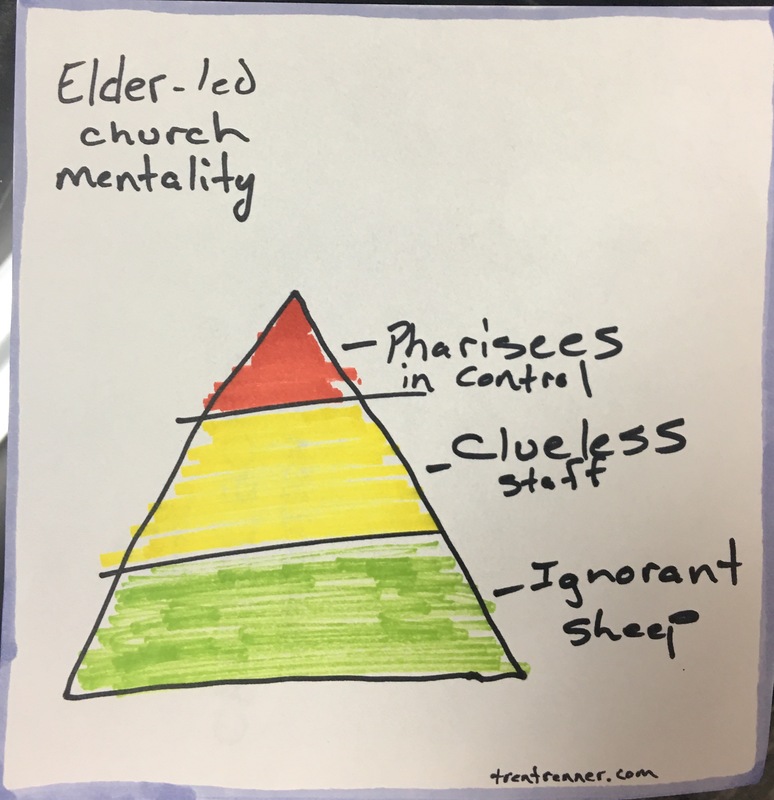 So…if your Church is a hierarchy…it is extremely sick. I suggest pic 3 below as your church of choice. If you are in a church that is pic 1 or 2… I’m sorry. Good luck changing it. You might have to, instead, move to a healthy church instead of change the one you are in. Insert something here about old dogs and tricks. Not impossible…but nearly. I repeat. Heirarchy Churches are sick and they need a serious long term visit from the one who is nicknamed, The Great Physician. That’s not Dr Oz. It’s Jesus. 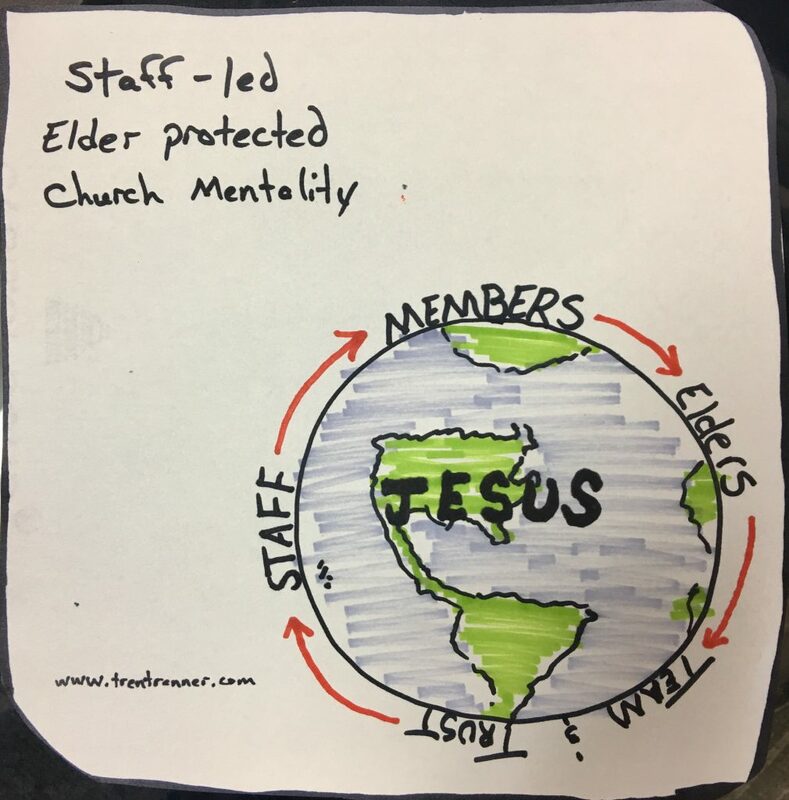 🙂 I’m so grateful to be in a Staff-Led, Elder protected Church. Boom! It is incredible! I freaking love it. I could break these down and make an entire book out of them. But…this is all you get today. Pick which Church you are in. Decide what you are going to do about it. Contribute to these thoughts in the comments section. I’m sure there are a few other styles, but they are very rare. Below is that fabulous art I promised above…The 3 most typical types of Churches are….